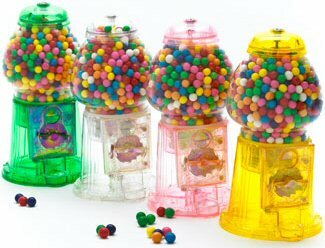 These antique style Transparent 11" Gumball Machines have a glass globe with a colorful transparent plastic body and coin mechanism. They will dispense junior gumballs, candy, or nuts using any coin. This machine is also preset to a "free spin" where no coin is required. Makes a perfect gift. Available in transparent Clear, Blue, Pink, Purple and Green. Holds 2 lbs. of candy or 1/2" Gumballs.